• Improvement in general health. • Improvement in sexual health. • Improvement in flexibility and joint mobility. • Development of the skeletal system. • Increase in muscular development & strength. • Increase in muscle recovery. • Increase in energy levels and endurance. • Prevention and reduction of inflammation. • Increase in blood supply and circulation. • Reduction of blood pressure. • Stimulation of the immune system function. • Improvement in mental health. VDA Pure acts as a natural adaptogen, helping to restore homeostasis to the body. 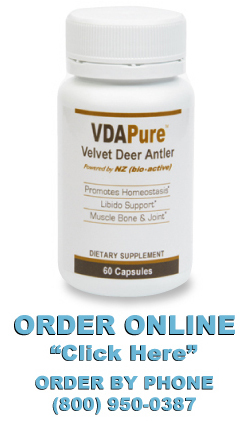 VDA Pure is 100% green, natural New Zealand Deer Velvet and is a powerful natural supplement with wellness enhancing restorative properties. Our PATENTED bio-active processing yields what is termed “NZ bio•active” which allows for optimal absorption. VDA Pure offers the purest, most bio-available Velvet Deer Antler available on the market. Velvet Deer Antler is a one of a kind, real super-food. It is comprised of the most concentrated source of vastly diversified nutritional substances found in the plant or animal kingdom. The nutritional composition of Velvet Deer Antler is highly complex and contains nearly 40 key compounds and 400 active ingredients. Velvet is the name given to deer antlers while they are growing and still in a cartilaginous state, and while bone is forming. 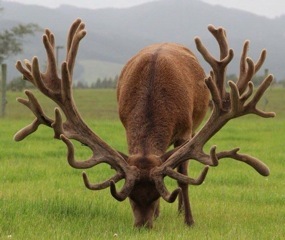 In this state they have a soft velvet-like covering and in Scotland, ancestral home of many of the wild red deer found in New Zealand, this soft furry velvet was known as ‘moss’ or ‘down’. Velvet Deer Antler acts as a natural adaptogen, restoring homeostasis to an unbalanced body by helping where it is needed. Velvet Deer Antler has an effect on many systems of the body given its complex chemical composition. The active ingredients in Velvet Deer Antler are mostly precursors that are required by the body to process substances that maintain its health and wellbeing.